In space applications, thermal control, emissivity and absorptivity are critical factors to the optimum performance of space vehicles or satellites. Thermal control coatings (TCC) are designed to have specific radiative properties that are tailored for different specific missions. For example, for solar orbiters, a radiative surface coated with a white coating having low absorptance and high emissivity is required. Usually, variously colored coatings from white to black are used for thermal design. In general, the function of TCC is to reduce external heat absorption and/or to regulate radiant heat exchange between on-board equipment on spacecraft. Black coatings with high emissivity and absorptance values are usually required for high temperature applications. As heat absorbing surfaces, they provide high absorptivity and emissivity properties. For example surfaces with black coatings with high emissivity can be used in the internal parts for equalizing the internal temperature, whereas external surfaces of spacecraft can be coated with coatings having lower surface absorptivity and high emissivity. In this paper a brief overview of black and white thermal control coatings manufactured in USA, Russia, France and Israel and their main strengths for a range of space applications will be presented. The testing of these coatings in high temperature applications where the choice for coatings is drastically reduced will be discussed. Since the coatings in near-planetary, inter-planetary and planetary environments are exposed to UV solar radiation, charged particles, atomic oxygen, extreme temperature gradients induced by differences in relative sun exposure and dust it is very important to study their behavior in simulated LEO/GEO and planetary conditions. The results of tests conducted on a number of coatings designed for LEO, GEO and interplanetary missions and the properties like atomic oxygen erosion resistance, surface conductivity, high temperature behaviour, BRDF characteristics, etc. will be presented. Influence of vacuum conditions on surface resistivity of inorganic coatings will be discussed. In the last decade, space materials scientists worldwide expressed a concern about the problems of space durability of various external space materials and coatings interacting with the space environment. The influence on the space environment has become one of the major concerns due to the significantly extended longevity of space missions, international collaboration on various space projects, first of all, the International Space Station development and operation, as well as space exploration. The selection of the best, most durable materials is associated with the main subjects of space exploration, such as space mission’s safety, spacecraft structures reliability and multi-million spending or savings. An international long-term research program was started in the 90th at ITL on comparative testing, durability evaluation, characterization and surface modification of advanced flight-proven space materials [1-4]. These aspects of space materials’ research become a special high-priority subject at the time of international collaboration and joint international agreements, for instance, such as the Agreement of 14 major space countries regarding their collaborative plans and efforts in the new era of global space exploration [5,6]. The major objective of this paper is to provide a brief review of the impact of different simulated space environments on a variety of Russian, US, French, and Israeli functional thermal control coatings being used in space flights. Thermal control coatings (TCC) from various sources were used in this program. The Russian materials included thermal control coatings manufactured by Kompozit Company in Russia. The western materials included advanced conductive and non-conductive last generation thermal control paints by Lord Corp. (USA), Alion (USA) and MAP (France) and some black TCC’s from Acktar, Israel. 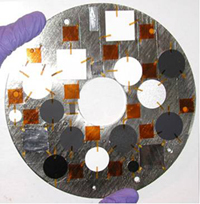 A number of these TCC’s, including the commercially available thermal control paints, and some experimental conductive (antistatic) thermal control coatings, have been treated and tested in ground-based testing facilities. The TCC’s that were used in this study and some of their properties are presented in Tables 1 and 2. Exposure to Lunar environment conditions in Lunar Dust simulator at ITL. Testing and characterization of functional and surface properties before and after the simulated LEO space environment tests included identification of material type, optical and SEM microscopy analysis. Surface composition and the functional properties, in particular, thermal optical properties, i.e. 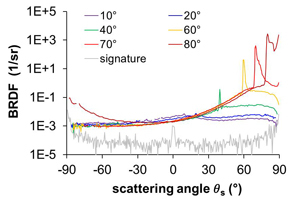 solar absorptance αs and thermal emittance ε, as well as surface resistivity, water contact angles have been collected or measured for a number of selected coatings with only limited data presented in the paper. A number of thermal control paint samples have been exposed to ~5 eV atomic oxygen beam with AO flux of ~(2-7)×1014 atoms/cm2/s . All samples were fixed to a metal sample holder plate 20 cm in diameter (Fig. 1). The sample holder was positioned at ~30 cm from the AO source. All material specimens selected for this testing were conditioned in vacuum for ~24 hours prior to AO exposure. A set of the Russian and Western thermal control space paints (Fig. 1) containing Russian EKOM-1, EKOM-1P, EKOM-2 and TRSO-TsM and European MAP space paints PN, PCBE and SG121FD; USA Aeroglaze A276 and Z302 space paints – have been exposed in two stages to a total FAO fluence of ~1.86×1020 atoms/cm2 (Tables 3 and 4) typical for a standard ground-based test of materials qualified for application in LEO. All Russian and USA organic paints experienced some mass loss due to erosion of organic polymeric binders, such as polyurethanes (USA) or acrylic copolymers (Russia). In case of TRSO-TsM silicate paint, the strong mass loss is related to desorption of significant amounts of water from the materials of this class. Contrary to this, surface stabilization and protection of MAP organosilicone paints was achieved under FAO exposure (see Tables 3 and 4). A mass gain was observed for PN, PCBE and SG121FD samples (from 1 µg/cm2 for PN black paint up to ~54.8 µg/cm2 for white PCBE, and ~85 µg/cm2 in case of white paint SG121FD) contrary to the mass loss for polyurethane (USA) or acrylic (Russian) organic binders that is an indication of surface conversion to a stable, self-protective, most probably silica-like surface structures. The FAO exposure experiments have confirmed the erosion resistance results for the PCBE and SG121FD white MAP organosilicone paints . In particular, the considerable mass gain of these silicone-based materials that was obtained during exposures at the CASOAR – European fast AO simulation chamber  that was confirmed also in this study can be explained by efficient surface conversion under fast atomic oxygen beams, leading to carbon reduction due to formation and release in vacuum of volatiles, and significant oxygen uptake, with subsequent formation of protective silica-like inorganic surface compounds. The highest FAO fluence achieved in this testing was relevant to long-duration space missions, i.e. it was approximately 1/5 – 1/7 of the fluence received by materials in ram direction during the 4 years of in-space MISSE-1experiment at ISS in 2001-2004, at the maximum of solar activity  and could be compared with ~1 year in space in MISSE-3 experiment in the 2004-2005 period . *) This high mass loss can be explained by desorption of bound water from this silicate paint, as indicated below. The appearance of exposed pigments and highly developed surface morphology, visible for the pristine EKOM-1 paint after the FAO testing at AOBF of MSFC , were clear signs of surface erosion (Fig. 2). FAO testing results for the PN Black paint are shown in Fig. 3. A comparison of surface morphology of the PN Black pristine material (Fig. 3a) and the FAO-tested sample (Fig. 3b) shows little changes as a result of FAO testing. The thermal optical and electrical properties of the various TCC’s used in this study are summarized in tables 5 and 6. The thermal optical properties of EKOM coatings after AO exposure didn’t change significantly. All US tested paints indicated also slight changes in optical properties as a result of AO exposure, except for the untreated A276:Z306 sample, which exhibited substantial change in solar absorptance. The solar absorptance of the untreated A276:Z306 decreased by about 0.26 and its thermal emittance increased by about 0.03. Besides optical stability, the maintenance of electrophysical characteristics is another major functional requirement of this type of conductive coatings. They must remain unchanged under vacuum and AO exposure. Additional work needs to be conducted to evaluate the effects of space environment factors on electrophysical properties of the conductive coatings and electrophysical stability under AO. Attention should be paid to the conditions at which the measurements are made. Thus the surface resistivity values of silicate TCC’s are affected by strong recoveries due the transition from the vacuum to air that affects also the solar absorptivity. Such recovery processes indicate at the necessity of performing measurements under vacuum or to get a precise knowledge on recovery mechanisms in order to take into account these effects if the measurements are done ex-situ. The Acktar coatings exhibit low reflectance values as can be seen from Fig. 4 that presents the hemispherical reflectance behaviour of various Acktar coatings [15,16]. The emissivity of coatings can be changed by applying appropriate formulation, for example high emissivity black paint and black anodize. Acktar vacuum deposited black coatings (thin films applied using proprietary vacuum deposition technology) reach nearly ideal infrared emitter values of 0.985% for coating thickness of just 5 microns. Fig.4. 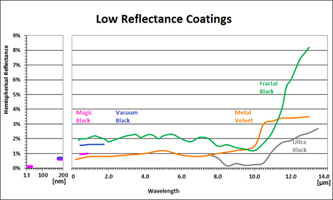 Hemispherical reflectance versus wavelength of selected AcktarTM coatings. Table 7 shows examples of emissivity values for some of the developed coatings over the wavelength range 3-30 µm. In order to successfully suppress stray light in complex optical systems, appropriate light scattering (BRDF) characteristics of the diffusing absorber coatings are essential. BRDF data of different wavelengths of the black coatings are of extreme importance for the development of such systems in order to model the generation and propagation of stray light and optimize the layout of the system accordingly . Acktar black coatings exhibit particularly low residual reflectance. However, even though the scattering distribution of these coatings was shown to be perfectly diffuse in the visible range and at near normal incident angles, this cannot automatically be presumed for longer wavelengths and oblique incidence. Therefore, BRDF measurements were performed at the Fraunhofer IOFon the Fractal BlackTM coating at three different wavelengths of 1.064 μm, 4.6 μm and 10.6 μm. Fig. 8 shows an example of a BRDF measurement obtained for the coating at 4.6 μm. A number of Acktar Vacuum BlackTM and Magic BlackTM coatings, consisting of two glass samples with a zig-zag coating pattern for surface resistivity measurements and eight titanium Ti6Al4V substrate coated samples, were thermally cycled in the temperature range from -120°C to +380°C in vacuum conditions of 1×10-5 Pa (7.5×10-8 Torr) for up to 100 cycles as part of a qualification process for the performance of Acktar coatings. 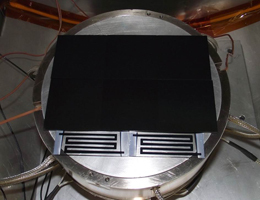 The Magic BlackTM coating was selected to be applied in METIS ((METIS)- Multi Element Telescope for Imaging and Spectroscopy – one of the six SolO solar remote-sensing instruments) project. The heating/cooling rate was 10 ± 2 °C/min. The dwell time at temperature extremes in each cycle was kept at 5 min. The samples were placed onto the surface of the sample holder plate as shown in Fig. 6. 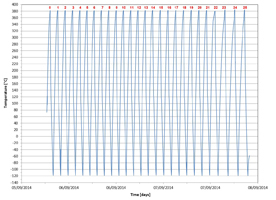 Temperature and vacuum pressure data were recorded during the test and stored in Microsoft Excel worksheets. A typical temperature profile is shown in Fig. 7. With revived international interest and plans for exploration of Moon and Mars, thermal radiator materials used in such missions will be facing the Lunar and Martian environments during such missions. For the Lunar/Mars environments, in addition to radiation stability and charge dissipation, additional challenges lay in identifying TC paints that are less sensitive to dusting, and, if still not durable enough under dusting conditions, to develop additional dust mitigation properties to the selected paints. A number of thermal control coatings were selected by ITL as part of a dust mitigation project for evaluation of their behaviour in lunar environments and their stability to Lunar dust. In this case, since the lunar environment conditions resemble close those of the GEO environment with the addition of dust conditions, the thermal control paints were selected among the paints that had proven their stability in GEO conditions. The significance of the surface morphology on both Lunar dust stimulant sticking and accommodation ability to space materials surfaces was one of obvious results in the program. Results obtained in water contact angle tests, when combined with the SEM data on silicate-based thermal control paints indicate that high porosity of the silicate paints may be an obstacle of using these paints in the dusty Lunar environment, even if they do show the best thermal optical characteristics among up-to-date space TC white paints and are the most promising for long-term GEO application. The charge-dissipative innovative silicone paint DS13N:6N/LO-HP developed at Alion Corp, has shown dust accumulation to be comparatively close to other paints, but did show very low sticking ability of the dust! The DS13N:6N/LO-HP paint may be considered as a promising candidate for the application in Lunar exploration, when used in short term missions, and, quite possible, considering it for longer time missions on the Moon. As a continuation of an international program initiated by ITL on comparative evaluation of space materials, a number of major properties of thermal control materials that are important in LEO, GEO, planetary and inter-planetary missions were evaluated and compared with a brief overview summary provided. TCC’s aimed at use in LEO environment were tested in three different LEO space simulator sources and the results were evaluated. Based on compiled and analyzed together FAO testing results, supported by post-testing surface analysis data, all materials in this study have been assigned to one of two major groups/classes, depending on their LEO space durability, i.e. a) stable or low-erosion with very low or no mass loss and low visible erosion on the surface; and b) significant, high-erosion, with a significant or very significant mass loss confirmed, together with sufficient or strong morphology change due to erosion of the surface. It was demonstrated and confirmed in this study through a large number of experiments that under oxygen plasma, FAO and FAO+VUV exposure, surface erosion occurs on organic paints, regardless of the supply source and origin of manufacturing. These changes do affect, to a different extent, their optical and electrical properties that are very important in many space applications. For all the tested silicate paints, regardless of their origin, the significant mass loss under FAO exposure was attributed to the loss of water of the silicate, or “liquid glass”, water-borne binders. It has been shown that all Russian EKOM paints maintain their surface resistivity and charge dissipative properties in imitated LEO exposure, even up to high FAO fluencies. These features favour them for both extended GEO and LEO uses, with some possible surface modifications performed for the LEO long-term missions that extend even further the useful life. A specially designed long-term LEO space flight experiment can be recommended for the MAP silicone paints to prove that they may either cause insignificant or not at all silicone contamination of the sensitive space optical surfaces. This data, if confirmed positively, opens the door for possible exciting opportunity of using MAP silicone paints in long-term LEO space missions. The results of extensive space qualification tests of the Acktar black coatings and their high temperature behavior renders them as good candidates for inter-planetary and GEO missions. Preliminary evaluation of a number of recently developed coatings by Kompozit and Alion companies in Russia and USA in conditions of lunar environment had shown that they can be good candidates for missions to Moon and Mars. The authors wish to acknowledge the help of all organizations providing the TCC samples used in these studies. Special thanks to Dr. Z. Iskanderova, Dr. V. Issoupov, Dr. S. Horodetsky for taking active part in many of the experiments and discussion of their results that are described in this paper. J.I. Kleiman, Y. Gudimenko, Z. Iskanderova, R.C. Tennyson and W.D. Morison, “Modification of Thermal Control Paints by PhotosilTM Technology”, Proc. of the ICPMSE-4, 4th International Space Conference, Toronto, Canada, 23-24 April, 1998, eds. J.I. Kleiman and R.C. Tennyson, Kluwer Academic Publishers, Space Technology Proceedings, v.4, pp.243-252, 2001. J.I. Kleiman, Y. Gudimenko, R. Ng, Z.A. Iskanderova, A. Grigorievsky, L. Kisileva, D. Edwards and M. Finkenor, “Surface Modification of Conductive and Nonconductive Paints for Space Durability Enhancement”, J. of Spacecraft and Rockets, v. 43, No.2, 2006, pp.443-450. J.I. Kleiman, “Surface Modification of Polymers, Paints and Composite Materials Used in the Low Earth Orbit Space Environment”, in Materials for Space Applications, edited by M. Chipara, D. L. Edwards, R. S. Benson, Sh. Phillips (Mater. Res. Soc. Symp. Proc. 851, Warrendale, PA, 2005), paper NN8.6. “The Global Exploration Strategy: The Framework for Coordination”. April 2007. J. Kleiman, S. Horodetsky, V. Sergeyev, V. Issoupov, and R. Ng, “Critical review of the design of space environment simulators: Lessons learnt”, Proc. of the 10th Int. Symp. on Materials in a Space Environment / 8th Int. Conf. on Protection of Materials and Structure from the LEO Space Environment, Collioure, France, June 19-23, 2006. Finckenor, M. M., Edwards, D. L., Vaughn, J. A., Schneider, T. A., Hovater, M. A., and Hoppe, D. T., “Test and Analysis Capabilities of the Space Environment Effects Team at Marshall Space Flight Center”, NASA TP-2002-212076, 5-6, Nov. 2002. T. K. Minton, and D. J. Garton, “Dynamics of Atomic-Oxygen-Induced Polymer Degradation in Low Earth Orbit”, In: “Chemical Dynamics in Extreme Environments”, Advanced Series In Physical Chemistry – Vol. 11, Ed. by R.A. Dressler, World Scientific, 2001. S. Schröder, M. Trost, T. Herffurth, A. von Finck, and A. Duparré, “Light scattering of interference coatings from the IR to the EUV spectral regions“, Advanced Optical Technologies 3, 2013, pp 113-120. Space and High Technology Paints and Coatings. MAP Corp., Booklet. S. Remaury, J.C. Guillaumon, and P. Nabarra, “Behaviour of Thermal Control Coatings under Atomic Oxygen and Ultraviolet Radiation”, Proc. of the 6th Int. Conf. on Protection of Materials and Structures from the Space Environment, Toronto, Canada, May 1-3, 2002, Kluwer Academic, Norwell, MA, 2003, p. 193. Z. Iskanderova, J. I. Kleiman, and R. C. Tennyson, “Pristine and Surface-Modified Polymers in LEO: MISSE Results versus Predictive Models and Ground-Based Testing”, Proc. of the 9th Int. Conf. on Protection of Materials and Structures in a Space Environment, Toronto, Canada, May 20-23, 2008. Y. Miron Salomon, N. Ariel Sternberg, I. Gouzman, G. Lempert, E. Grossman, D. Katsir, R. Cotostiano, T. Minton, Qualification of AcktarTM Black Coatings for Space Application., 11th ISMSE International Symposium on Materials in a Space Environment, 15-18 September 2009, Aix-en-Provence, France. S. Schröder, A. von Finck, D. Katsir, U. Zeitner, and A. Duparré, “Light scattering characterization of optical components: BRDF, BTDF, and scatter losses”, Proc. SPIE 9272, 2014, pp. 927202. Z. Iskanderova, J. Kleiman, A. Grigorevski, L. Kiseleva, M. Kenny and S. Remaury, Comparative Testing and Evaluation of Vulnerable External Infrastructure Materials and Components for Lunar Applications, ISMSE-13, 22-26 June, 2015, Pau, France, 2015.